Jill and I decided to bake hamburger buns together. Dave and I eat a lot of veggie burgers, so having homemade buns was a real treat. This is the recipe that I used. I left the egg yolk off and they turned out perfectly fine. Without the egg yolk, all you need to do is use vegan margarine instead of the butter, and soy milk instead of regular milk to have a vegan version. Easy! The rolls were soft like regular hamburger buns but they also had some of the chewy texture of bread. They were delicious and held up well with all of the messy condiments. Dave has to have everything on his burger--mustard, ketchup, vegan mayo, onions, pickles, lettuce and tomatoes--so store bought buns usually disintegrate. This buns were nice and sturdy but also soft and puffy. I'd love to make them again. 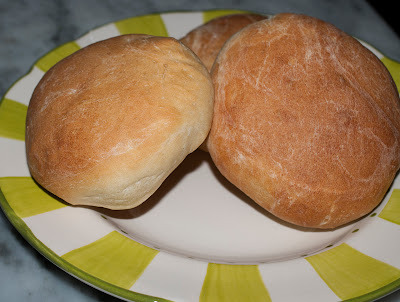 Please visit Jill's blog to see her beautiful hamburger buns and check out the recipe that she used. They look wonderful! I loved how mine didn't disintegrate either - homemade buns are the way to go!